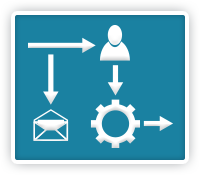 Business process automation. Made practical. Automate, monitor, and report on the efficiency of any business process automated in SharePoint. The promise of successful Business Process Management (BPM) in SharePoint is to drive automated processes involving people, systems, data sources, locations, and organizational entities. A fruitful BPM implementation requires perfect alignment of people, timing, and information and the results can be profound: Quality improvements, cost reductions, productivity, accountability, and consistency in the customer experience all await those organizations that can drive a successful BPM initiative. The Bluespring BPM Suite is a business automation tool that drives business processes involving any combination of people, systems, data, locations, and organizations. It automates, monitors, and reports on the efficiency of these processes for continuous improvement. Utilizing the Microsoft technology platform, BPM Suite makes business process automation practical for any organization. It is a robust, yet affordable, BPM solution that meets the needs of process owners, process professionals, and IT professionals in a single design, deployment, and process management platform. Align the right people at the right time with the right information. Transition smoothly with software that is already optimized for a Microsoft environment. Design, automate, and substantiate compliance with established processes. Easily apply to your specific business needs and industry using a “drag and drop” interface. Easily and affordably implement business process automation software typically reserved for larger enterprise organizations. Achieve rapid ROI by effectively leading quality improvements, cost reductions, productivity, accountability, and consistency in the customer experience. "As we developed the tool, it really made us take a hard look at all of our projects and leverage the power of automation for productivity gains." "The Bluespring team worked with us to get all users’ perspectives, and customize BPM to our nuances and the way we do business. Now, we couldn’t do our jobs without it!"